What is antigen retrieval and how does it work? Antigen retrieval is an effective method of unmasking antigenic epitopes on the surface of formalin-fixed paraffin-embedded (FFPE) tissue sections. 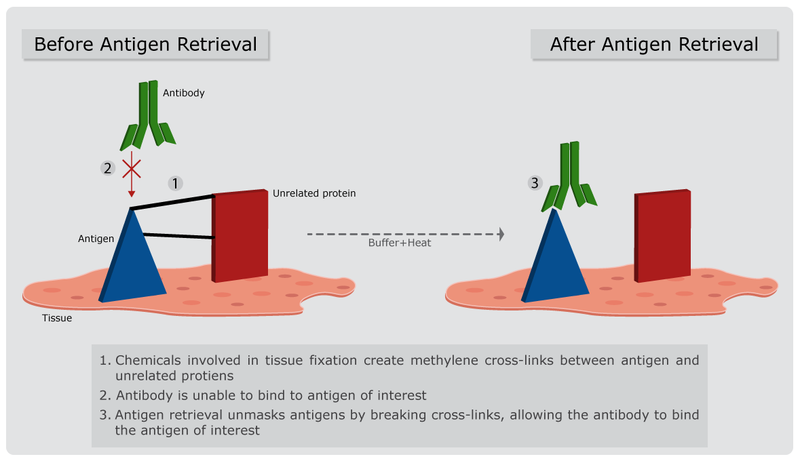 The antigen retrieval technique breaks the methylene bridges between epitopes and unrelated proteins to expose antigenic sites for antibody binding (1) (Figure 1). BioGenex Laboratories Inc. invented the reverse epitope masking method in 1991 (2), with this assay now being routinely practiced in laboratories throughout the world. Why is antigen retrieval necessary? Protein fixation with fixative agents stabilizes tissue sections by creating cross-linking between amino acids within the protein structure, or with other peptides within the tissue. These methylene bridges mask tissue antigens and restrict antibody-epitope binding. The impaired ability of antibodies to access epitope sites in fixed tissue can impact immunohistochemistry (IHC) staining or in situ hybridization (ISH). Antigen retrieval eliminates these biochemical interactions and enables an antibody to access the target antigen. Antigen retrieval is carried out before immunohistochemical (IHC) staining or in situ hybridization (ISH) to unmask hidden or denatured target epitopes. Antigen retrieval may not be required for frozen sections where fixation is mild (ethanol), or for polyclonal antibodies which recognize multiple epitopes. The optimal antigen retrieval technique depends on the target antigen, the primary antibody, the tissue type, and/or the method and duration of fixation. Immunoreactivity of an epitope can be recovered using either proteolytic-induced epitope retrieval (PIER) or heat-induced epitope retrieval (HIER) methods (3). PIER is an enzymatic method of antigen retrieval which relies on enzymes such as proteinase K, trypsin, or pepsin to unmask the antigenic epitopes by cleaving peptides. The disadvantages of PIER are the low success rate for restoring immunoreactivity and the potential for destroying both tissue morphology and the antigen of interest. HIER is the most common approach to antigen retrieval in FFPE tissue and has a much higher success rate than PIER (4, 5). HIER successfully allows for a set of conformational biochemical changes that reconstitute the structure of the fixed proteins. HIER has revolutionized the application of IHC in surgical pathology. It is a pretreatment procedure often used prior to IHC or ISH assays to improve staining reactions and restore an epitope’s secondary and tertiary structure. Currently, over 95% of the commonly used antibodies used in IHC laboratories need HIER to achieve satisfactory results (6). The most common HIER equipment currently in use is the microwave oven that utilizes heat to retrieve antigens and restore antigenicity (2, 7-9). With the microwave oven it is easy to set the optimal retrieval temperature and time. The efficiency of HIER depends on temperature, time, pH and chemical composition of the buffer such as citrate, EDTA, or Tris. Therefore, the best method must be optimized to prevent morphological damage and allow for proper antigen unmasking. 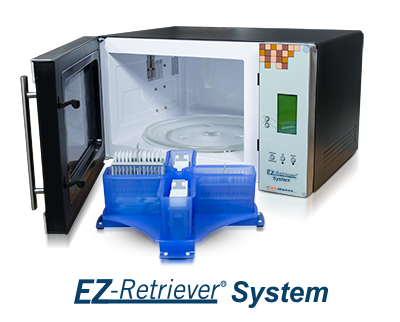 The EZ-Retriever® System is a microwave-based pretreatment and antigen retrieval system invented by BioGenex. This system is used for dewaxing, rehydration, and antigen retrieval of FFPE tissue sections to enhance exposure of antigenic epitopes. This system resolves the issues of inconsistency due to different types of antigen retrieval methods with varying maximum microwave power levels, solution volumes, and heating time. It facilitates the standardization of dewaxing and antigen protocols to produce high quality and reproducible stains. It is also user-friendly and high throughput (100 slides in <30 minutes). Using the EZ-Retriever® Microwave System large collections of archived FFPE tissue sections that were available in every pathology lab could be turned into valuable medical samples for diagnostics and translational research. Boiling FFPE tissue sections in buffer, such as citrate, EDTA, or Tris, break the methylene bridges formed during fixation and help in recovering the masked epitopes. When used in conjunction with the EZ-AR™ Elegance retrieval solutions, it includes standardized protocols for antigen retrieval. BioGenex has developed solutions for antigen retrieval, decal retrieval in decalcified tissues, and nucleic acid retrieval for in situ hybridization (ISH) applications. BioGenex’s new EZ-AR™ Elegance retrieval solutions eliminate common issues such as improper heat distribution, buffer evaporation, tissue drying, and boil-overs during antigen retrieval. Using EZ-ARTM Elegance solutions with the EZ-Retriever® Microwave System streamline the retrieval processes, including deparaffinization, rehydration, and antigen retrieval. The quality of the staining results depends on adherence to the antigen retrieval protocol. Briefly, the reagent containers are firstly filled with antigen retrieval solution, followed by placing the rack of slides into the reagent containers and then placing them inside the EZ-Retriever® Microwave System for treatment. Figure 1. Antigen retrieval method. Shi SR, Shi Y, Taylor CR. Antigen retrieval immunohistochemistry: review and future prospects in research and diagnosis over two decades. J Histochem Cytochem. 2011;59(1):13-32. Shi SR, Key ME, Kalra KL. Antigen retrieval in formalin-fixed, paraffin-embedded tissues: an enhancement method for immunohistochemical staining based on microwave oven heating of tissue sections. J Histochem Cytochem. 1991;39(6):741-8. PubMed PMID: 1709656. Kim SW, Roh J, Park CS. Immunohistochemistry for pathologists: protocols, pitfalls, and tips. J Pathol Transl Med. 2016;50(6):411-8. K R V, Jones D, Udupa V. A simple and effective heat induced antigen retrieval method. MethodsX. 2016;3:315-9. O'Hurley G, Sjöstedt E, Rahman A, Li B, Kampf C, Pontén F, Gallagher WM, Lindskog C. Garbage in, garbage out: a critical evaluation of strategies used for validation of immunohistochemical biomarkers. Mol Oncol. 2014;8(4):783-98. Analytical parameters. Accessed from: http://www.nordiqc.org/downloads/documents/9.pdf (last accessed on 26 Oct 2018). Gu L, Cong J, Zhang J, Tian YY, Zhai XY. A microwave antigen retrieval method using two heating steps for enhanced immunostaining on aldehyde-fixed paraffin-embedded tissue sections. Histochem Cell Biol. 2016;145(6):675-80. Katoh K. Microwave-assisted tissue preparation for rapid fixation, decalcification, antigen retrieval, cryosectioning, and immunostaining. Int J Cell Biol. 2016;2016:7076910. Shruthi BS, Vinodhkumar P, Kashyap B, Reddy PS. Use of microwave in diagnostic pathology. J Can Res Ther 2013;9:351-5.